DLS~ August Shopping List! | .:Soul:. Let’s get this shopping list started! I am absolutely THRILLED to be part of two great events this August! 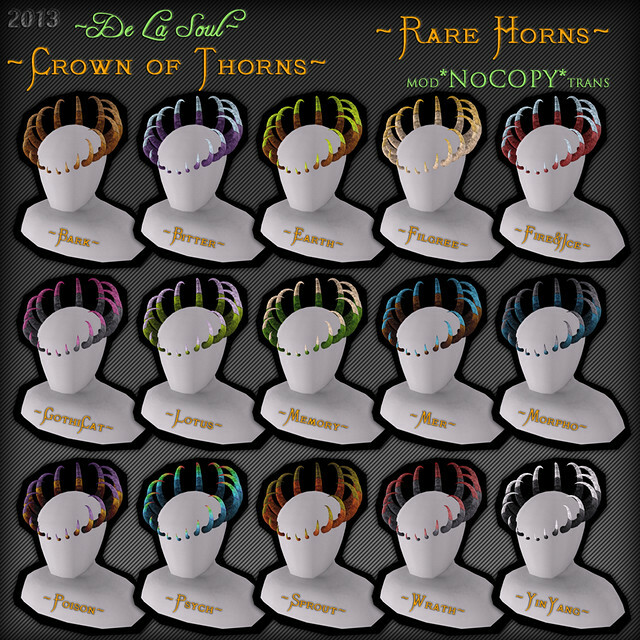 I have 30… yes, THIRTY different variations of a brand new set of MESH horns, called The Crown of Thorns for you to pick up… with 15 Common single colors, 15 Rare dual colors, Plus…..
With ALL horn textures included, plus 32 gem textures, 5 metal textures, and options to change shine, glow, bright, etc…. 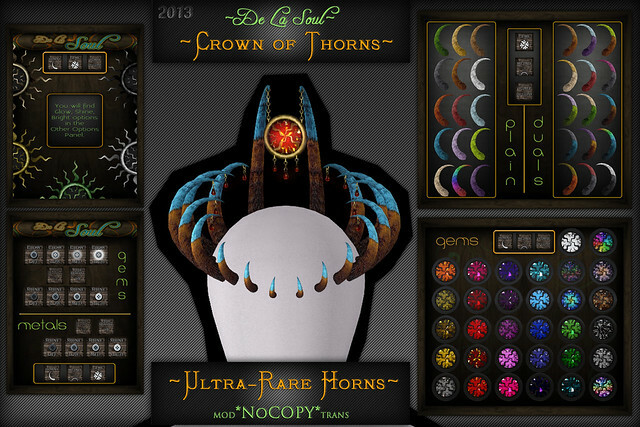 this is truly the Crown of Thorns of a Royal Demon! By the way, it’s only 50L per play! OMG OMG OMG I got in! EXCLUSIVE to We ❤ RP! 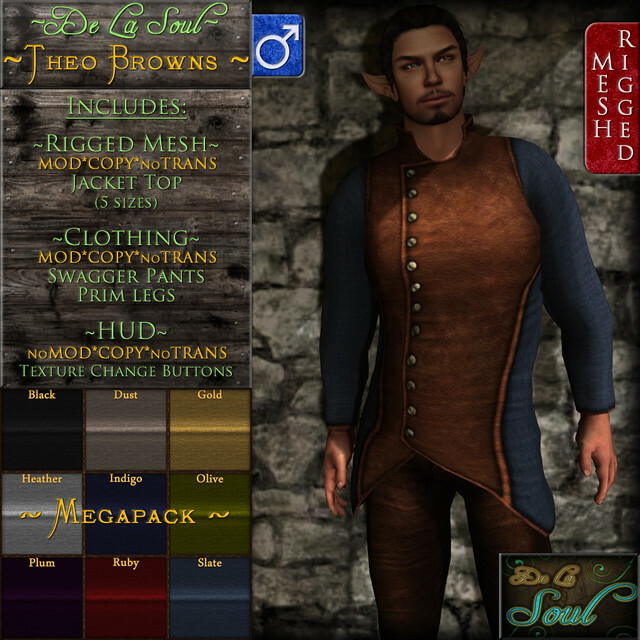 I have a NEW MESH RELEASE called The Thea and The Theo in two Special Edition textures! With so many caps, it HAS to be good! Plus… EXCLUSIVE! You will ONLY be able to get these two variations at the We ❤ RP! Round 4 Event! Normal price for the regular colors of these will be 299L each, and I am going to go even BETTER than exclusive and give you 50% off! That’s 149L each, for those like me that had to grab a calculator for that one. They come with HUDs to change the button textures, Bronze, Silver, and Iron, along with shine, and full bright on them too. Just like the ones above, only with 9 colors to pick from! Available in either Black or Brown leather. I really don’t hand out freebies or gifts to the VIP Group all that often. I know this. I am sorry. BUT…. I created these outfits for a ceremony in RP, then kinda.. kept making trim colors for them. Since it is only the trim that is changing, I am offering them only as a Megapack. 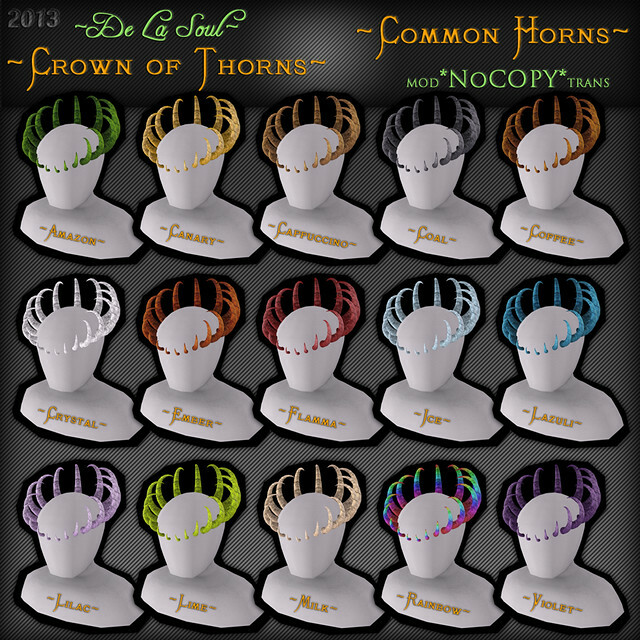 You get all nine (9) trim colors, AND… VIP Members also get a 50% discount! Gals get the skirt, Guys get the pants, but you can always buy both and mix and match! They are fairly simple, and made for men only right now. (I have promised a friend I would work on a female version soon!) 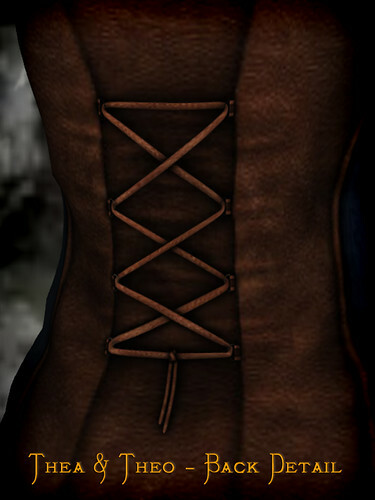 The included HUD, swaps the daggers from the holster, to your hands and puts you in a basic ready animation. Best part? They are MOD and COPY so you can add your own weapon scripts if you are so inclined! I had been meaning to remake the building we use in Amras as the Library to make it a bit more… fitting. So I did, and named it after our current Librarian and Archmage. 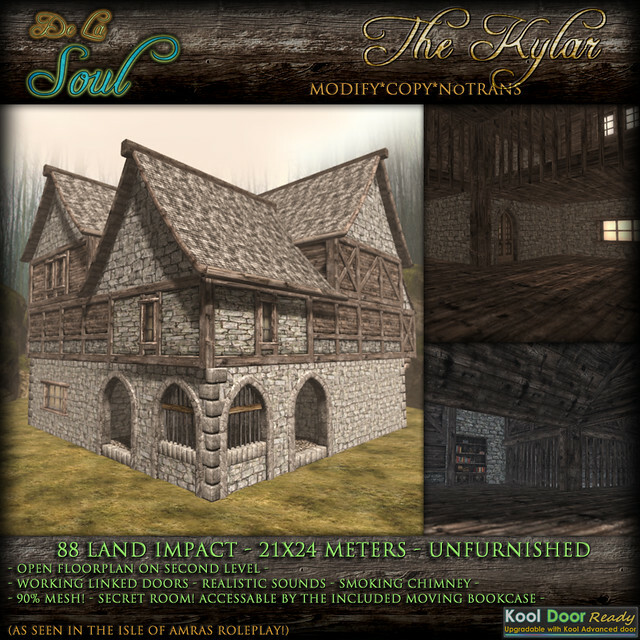 With the second level open to peer down at those below, a small patio at the entrance, and… a secret room… (I really am becoming fond of making those) This building is sure to add a bit of style and ambiance to your Medieval Fantasy sim. The symbol for the Royalty in Amras is a rising sun. 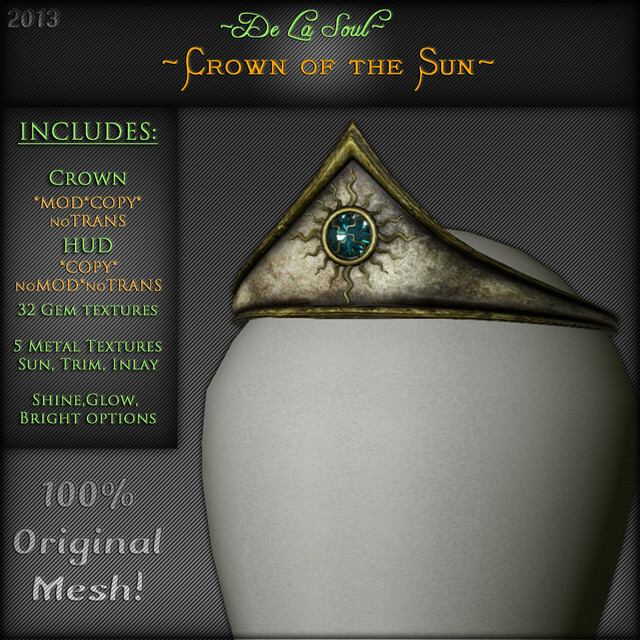 As such, with a coronation on the way, i made these crowns with the sun emblazoned on them. 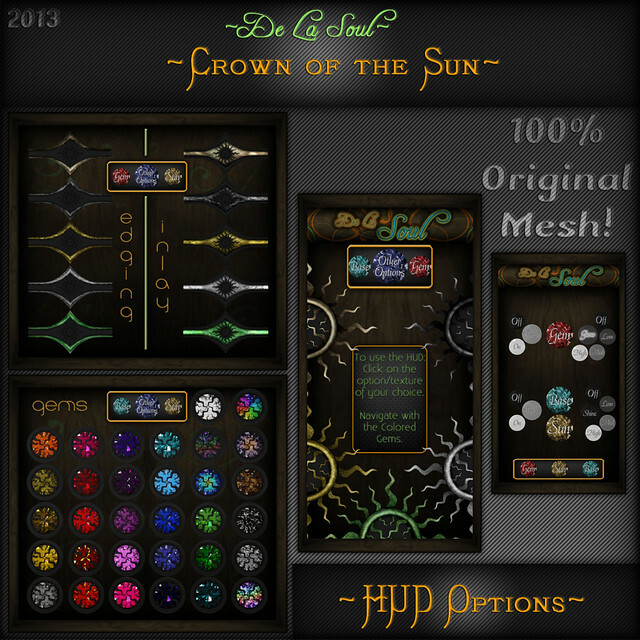 Again, 100% original mesh! Should I start with pictures, or the options I wonder? Okay, so it’s a crown. Well, there are two, one for a Princess or Queen, and one for the guys. Sold separately. With them, you get this nifty HUD, and that HUD allows you to change… EVERYTHING! 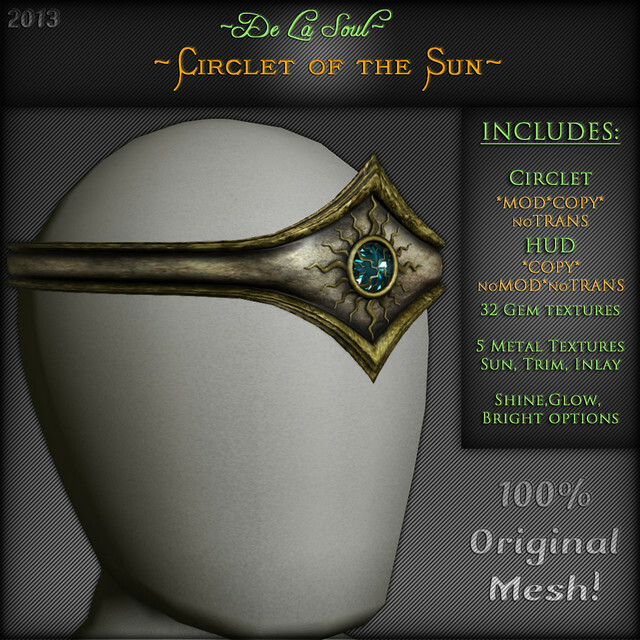 For the metal Trim, Inlay, and Sun, you get 5 textures to choose from. There are 32, yes, THIRTY-TWO Gem textures! Plus you can change other options like shine, glow, and bright! Okay, okay, but what do they look like? They are just a HUD to wear, and include all of the fabric colors in each. Just wear and click the color tunic you are wearing! Easy! Look for their vendors beside each outfit in the main store, or inside the outfit’s vendors. Just scroll until you find it! To get updates, got to the main store and slap the Redelivery terminal if you haven’t already been sent one from my servers. As always, all updates are FREE! I think that’s it… Yeah, that’s it for now. There will be more later, I just can’t… brain things. Enjoy your shopping list and the events! I know I will! This entry was posted in Accessories, Buildings & Decor, Clothing, Events, Glamor, New Releases and tagged advertising, amras, appearance, avatar, beauty, building, castle, ceremony, circlet, clothing, clothing colors, clothing layers, crown, de la soul, event, fantasy, fashion, game of thrones, gaming, gatcha, GOT, horns, jacket, jewlery, kylar, library, makeup, Medieval, megapack, mesh 3d, new release, piece skirt, robe, roleplay, second life, secondlife, secret, shopping, skirt outfit, stair, style, sword, trim, tunic, We <3 Role-Play!, weapon. Bookmark the permalink.